Describe JACK AND THE BEANSTALK from your perspective. Doug Burks: It was one of the first fairy tales I remember as a child. There was a picture book that I had as a child, and then I remember the iconic Mickey Mouse film. Sally Fiorello: That’s what I was going to say! Mickey Mouse and the Beanstalk, which is a beautiful, beautiful animated feature that I loved. The Giant scared me as a kid, and in that cartoon, he was certainly a little bit scary. I think I really believed there were giants when I was a kid. Describe JACK AND THE BEANSTALK using three words. 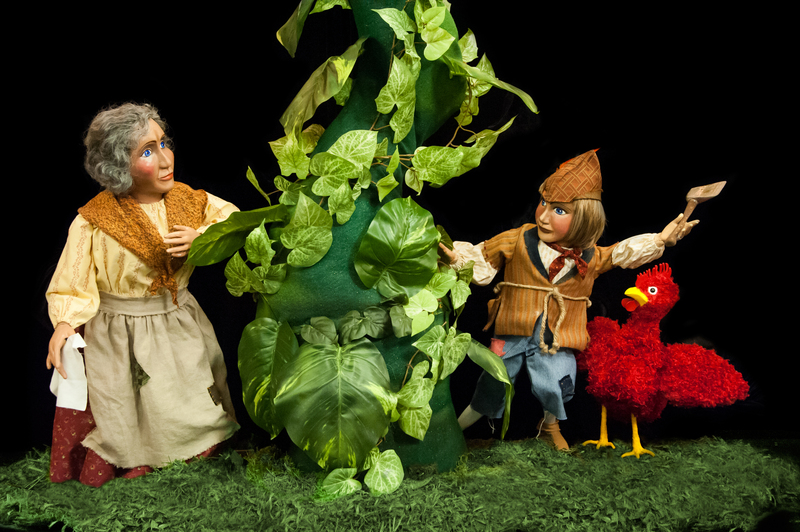 What do you like most about JACK AND THE BEANSTALK? SF: I love the growing of the beanstalk. And the interaction with Goldie the Hen and all the characters. DB: Yeah, Goldie is kind of our scene stealer. SF: I also like the addition of the Man in the Moon to the typical Jack and the Beanstalk story. DB: That idea was inspired by the old Sue Hastings script that we have, because that’s the way they did it. They had that character in it. SF: And we WAY expanded on it. He’s got a song and a whole scene with some starlettes. If there had been more time when we first dreamed it up, his storyline could have been expanded even more. What kind of experience are you trying to create for audiences? SF: I think it’s an adventure story first. Jack is certainly setting out on a journey that is an adventure – climbing a beanstalk way up into the sky – and then he sees the Giant. I think we are taking the audience on a sort of fantastical trip that they can’t take themselves on in their everyday lives. When I was a kid, fairy tales figured prominently into my entertainment, whether it was my mother reading me a story or seeing Disney’s Snow White and the Seven Dwarfs, now people sort of forget about them. DB: So the experience we’re trying to create for our audience is a classic fairy tale, the way they used to be. What is it like being a director? DB: It’s kind of a daunting task, having to be responsible for every single element. But at the same time, it’s incredibly rewarding. SF: There are certainly different problems with directing a puppet show versus one of our shows where live actors are front and center. 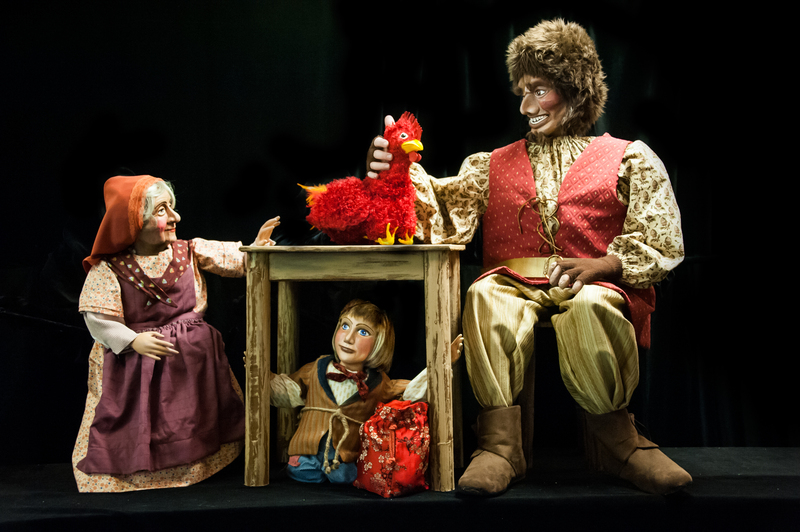 Knowing what puppets can do as opposed to what people can do, and what the style of puppetry can accomplish is different; there’s a lot of different variables. DB: What’s different about the way we work, too, is that oftentimes, our company will voice a character and puppeteer that same character. But we also have to hire other actors to voice certain characters. It’s just a different set of skills that puppeteers/actors have to incorporate. How have you seen theater change someone’s life? DB: Well, it changed my life! As a child, I often felt very introverted and shy, and it wasn’t until I got into theater and performing that I overcame a lot of that. It taught me to express myself. SF: It absolutely taught me to express myself, and aided in my education. It opened my mind up to wanting to know more, because it gave to me in a way that was dramatic or exciting or compelling, as opposed to a teacher saying “na na na.” It was like a world that was suddenly in front of me, and I wanted to be a part of that. 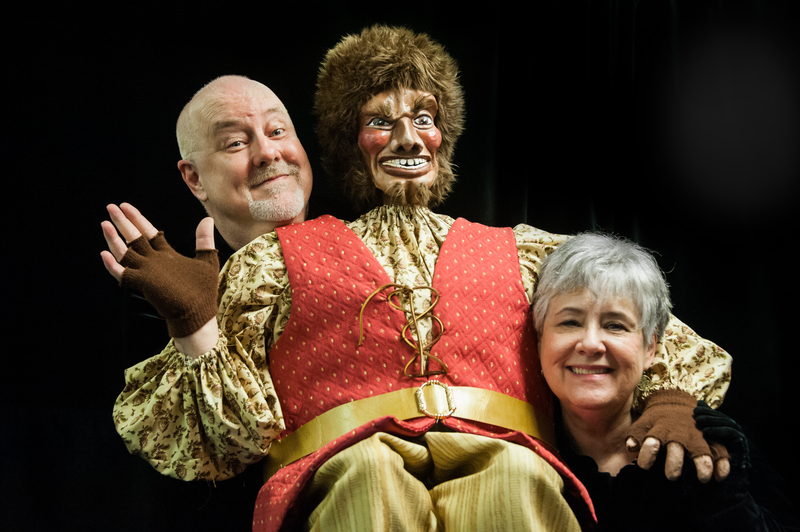 Why are you interested in children’s theater? DB: The arts and theater in education can be very, very valuable, whether you choose a career in the arts or not. We must continue to build, not only the future artists, but the future audiences as well. SF: As with all of the arts, theater makes a complete person. I believe when the arts are missing, we lose empathy. We lose what being a human being is all about. We become something else, and I worry about the kind of human that will exist if the arts are just kind of pushed by the wayside. Describe a memorable moment you’ve had at DCT. DB: Well they all involved the audiences, their responses. An audience full of children is often so much more honest than an audience full of adults. The feedback is so immediate; they’re less likely to censor themselves. DB: They’re going to laugh. If they don’t like something and get bored, they’re going to start talking. You know when they’re not paying attention. SF: There have been so many times when people, when kids especially, have been so enamored with what they’re seeing and that feels really, really good. DB: I first was an actor at DCT in 1989, so I’ve also worked with a lot of children that have come through our productions. That’s kind of a great thing to work with an actor as a child, and there are many of them now that are grown that I get to work with again as adults. Like Katy Tye. SF: When he was here did you work with Montgomery Sutton? DB: Yeah, Montgomery Sutton, there’s just too many to even remember. These kids that I worked with when they were seven-, eight-, nine years old, and then I get to work with them again as adults. What’s your favorite children’s story and why? DB: Winnie the Pooh. I could really relate to those characters; sometimes I could relate to Eyeore, sometimes to Pooh. I can just really relate to that story of how our childhood toys and friends will always kind of stay with us. SF: That’s beautiful, Doug. It probably would go back to certain movies like Bambi, for me. I liked Bambi so much because I am such an animal lover. One more recent movie that is also a play that I love is Babe, the Sheep Pig. I think that story shows the nobleness of animals, and why we should respect them. It’s so humorous and so loving. It’s full of wonderful life lessons. 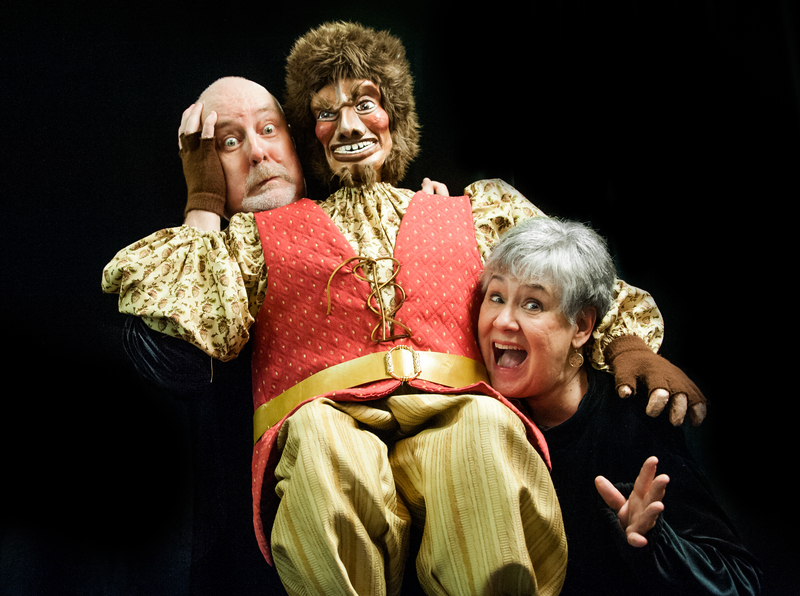 Kathy Burks Theatre of Puppetry Arts’ JACK AND THE BEANSTALK runs March 3-26, 2017. With shows during Spring Break and on the weekends, there’s plenty of time for you to climb up the beanstalk with Jack. Visit dct.org for more information about the tickets and show times.